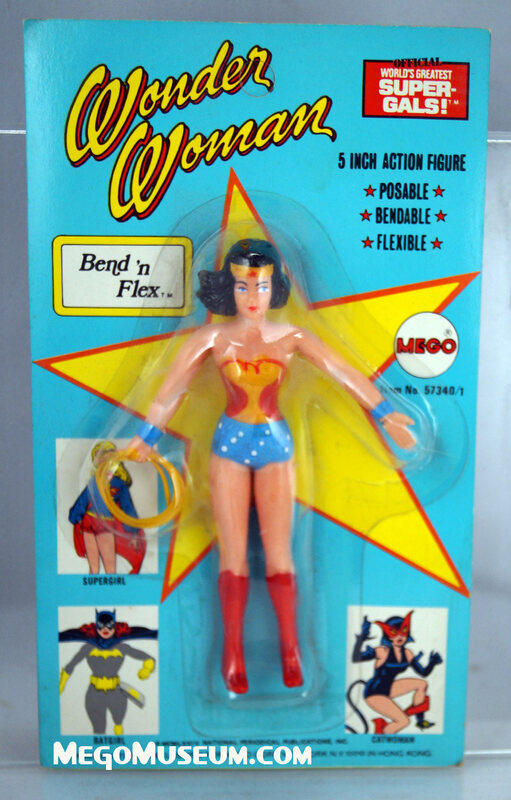 Bend n’ Flex Heroes were a nice compliment to the Mego 8 inch World’s Greatest Superheroes brand. 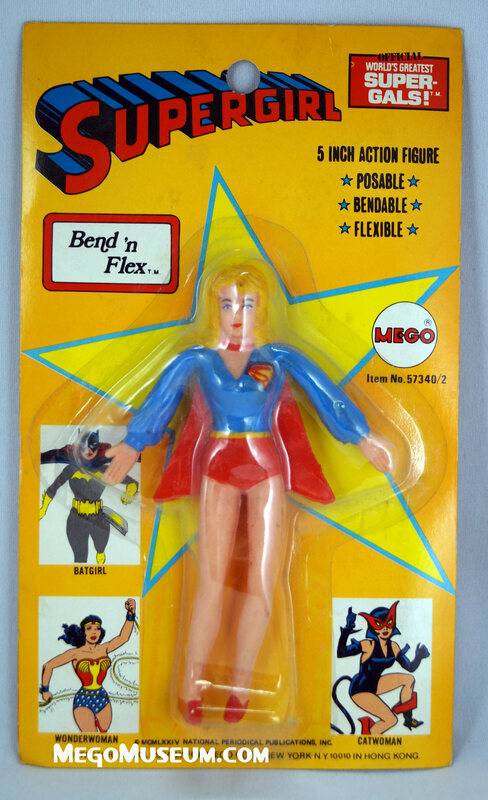 Released in 1974, the Bend N’ Flex along with the Super Softies were Mego’s first attempt to expand upon the Superhero license into other formats. 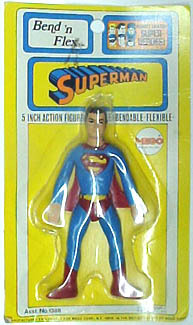 While the Super Softies were described as a “bomb” by former Mego VP Neal Kublan, the Bend N’ Flex characters sold well. 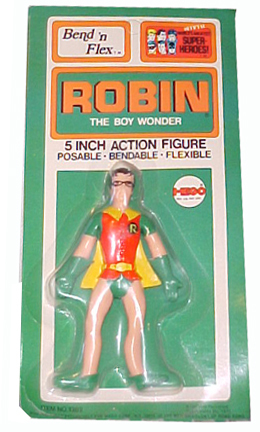 In fact, it’s believed that the line was canceled because the low-cost figures (they retailed for under a dollar) probably cannibalized sales of the 8″ core figures. 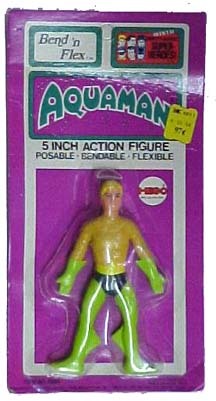 Cheap and colorful, they are charming in their cartoony brilliance. 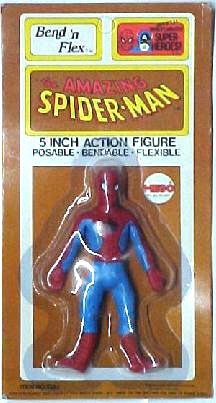 Many details not present in the 8″ World’s Greatest Superhero figures show up in the Bend N’ Flex Line. 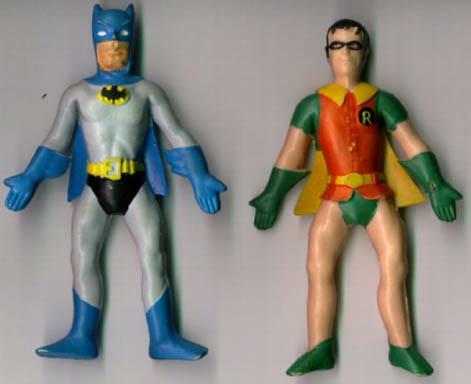 Penguin and Mr. Myxlpltc are shorter than the other characters, Penguin has his umbrella, Joker has his cane. 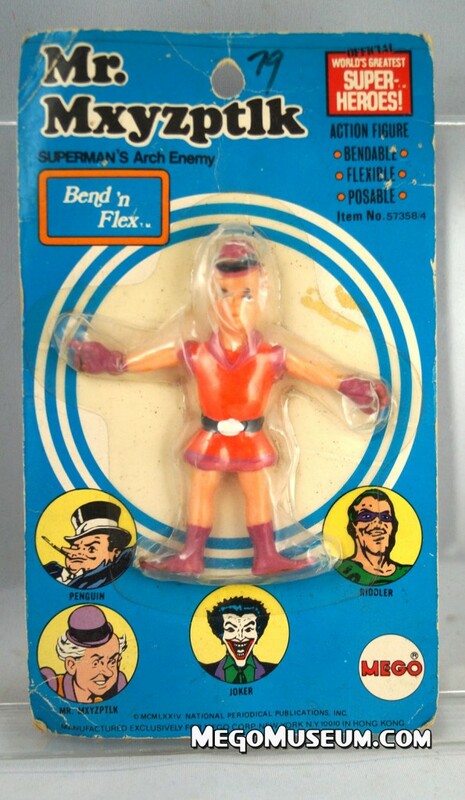 Every character that was released in the 1974 World’s Greatest Superheroes line up was released as Bend N’ Flex character. 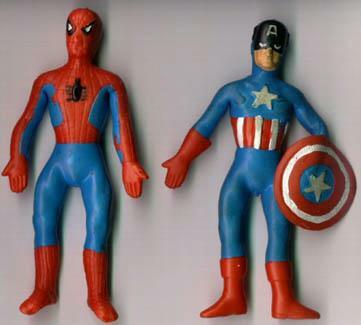 The line consisted of mainly DC characters, with Captain America and Spider-Man being the two Marvel characters and of course, Tarzan being the only indy character produced. The cardbacks changed on the line several times, suggested different production runs. We’ve illustrated the differences below. 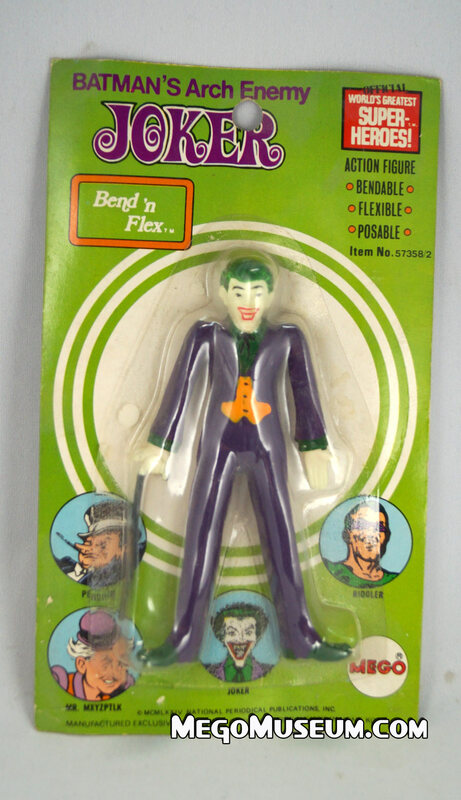 Mego also made Planet of the Apes Bend N Flex figures and we have a wonderful gallery for that. 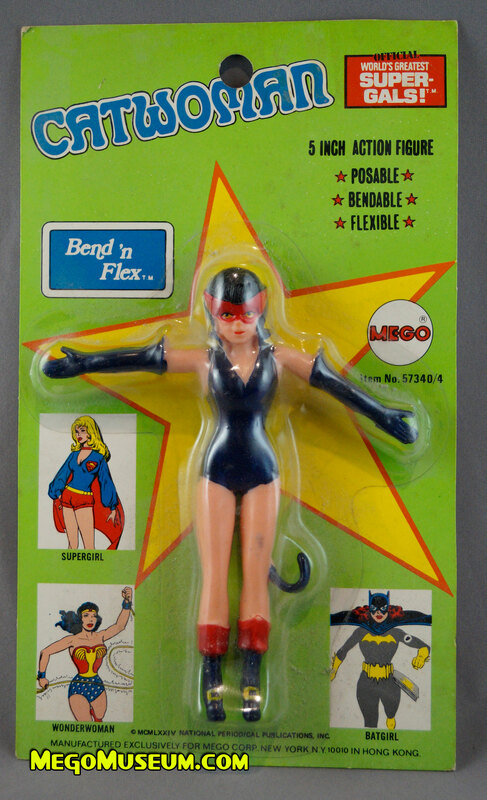 Just like their 8″ counterparts, the Bend N’ Flex heroes were sold in display boxes, three are none, Heroes, Super Foes and Super Gals, they are incredibly hard to track down. 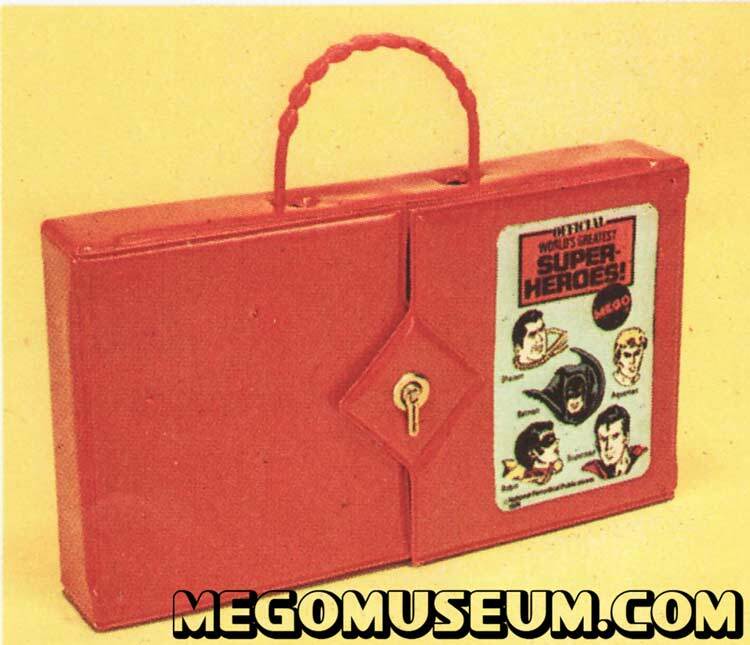 The 1974 Mego Catalog advertised a carrying case for Bend N Flex figures but it was not produced. 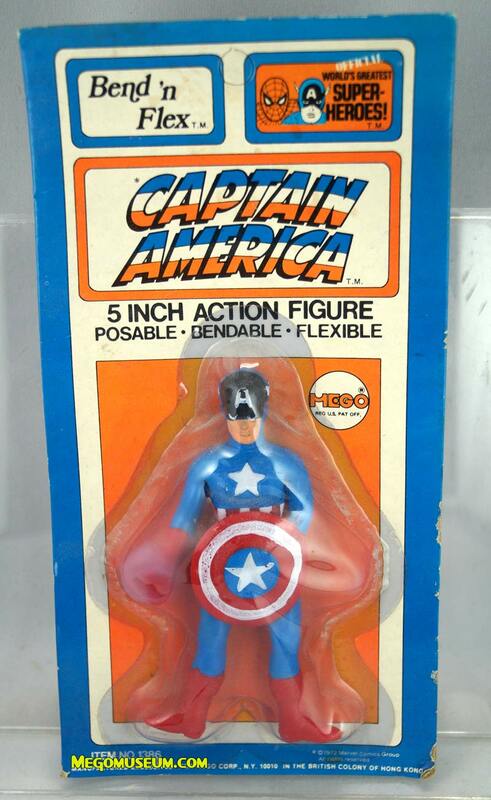 The scans below of real life Bendies provided by Scott Arendson. While cute to find loose, the BnF take on new meaning when found carded. 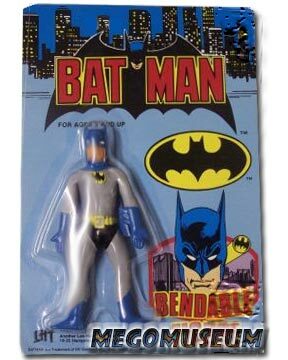 Their packaging styles closely ape the cards at the time but come off even more visually striking than the 8″ packaging. 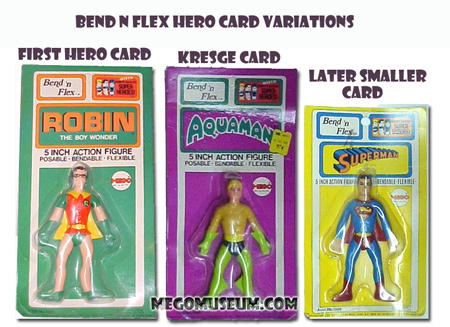 The Above chart shows that the Bend N Flex Heroes (strictly the men here) actually had three different kinds of packaging meaning they were part of the first wave. 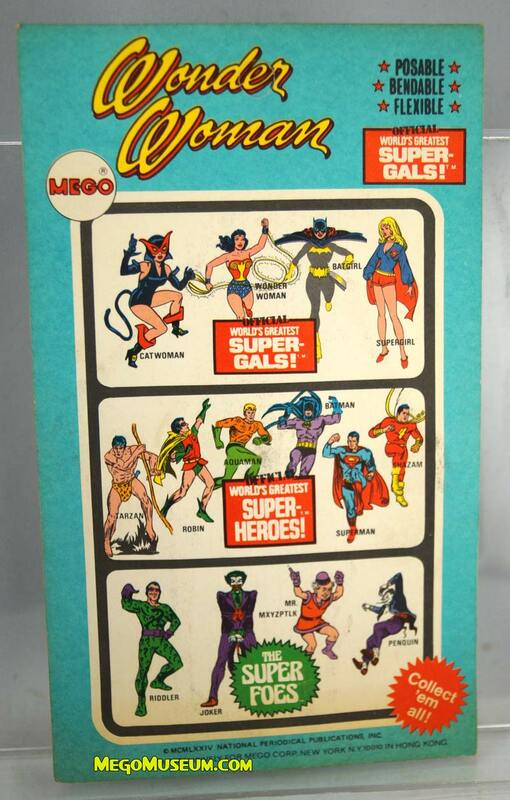 The Super Gals and Super Foes followed later and by that time Mego had settled for the “short card”. 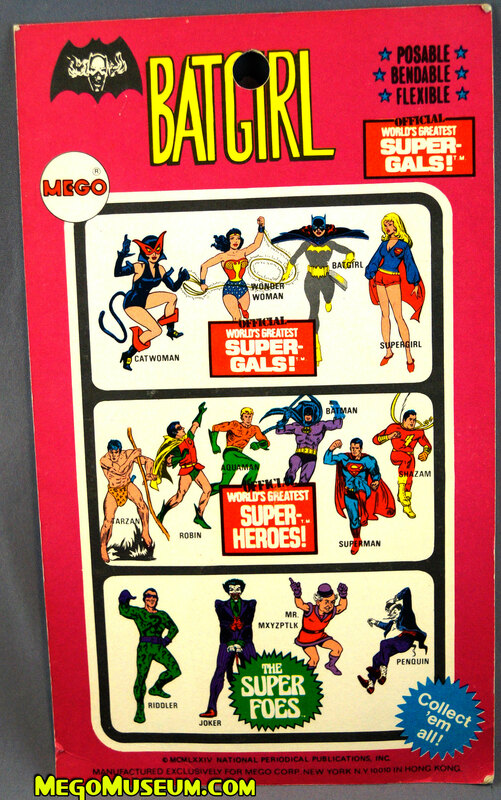 As you can see the backer only depicts Marvel properties on this second version card. 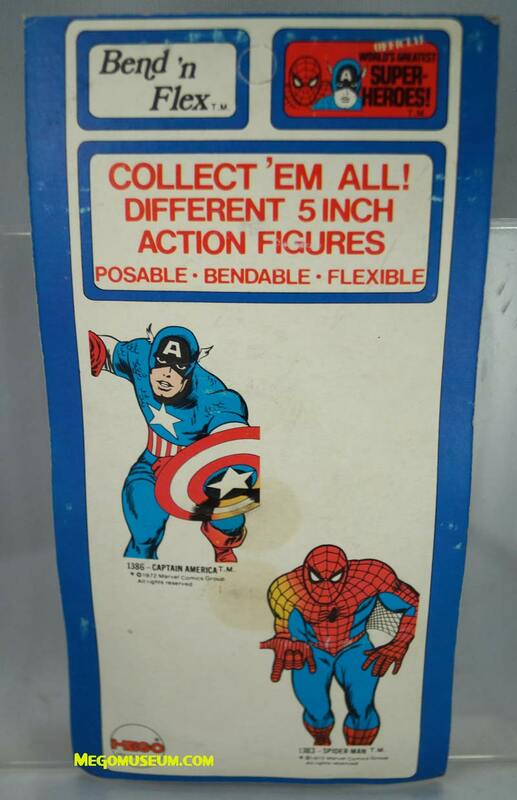 Marvels. Above is the long and short carded Cap. 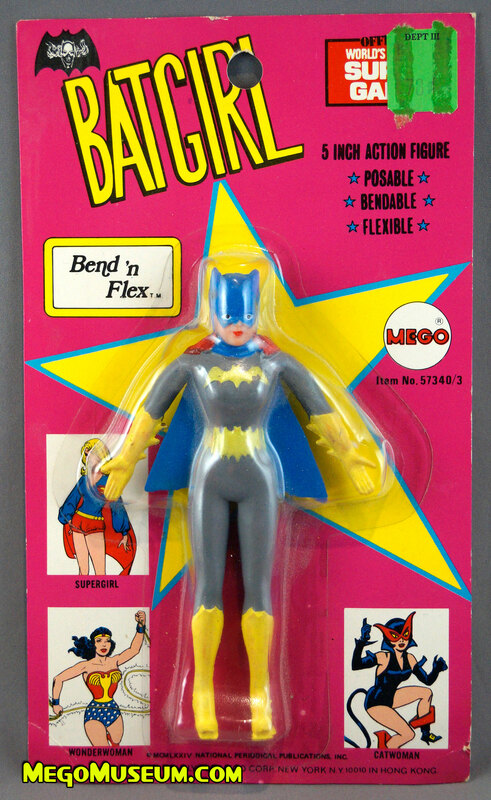 Batgirl is just as gorgeous as her eight-inch counterpart. Catwoman in her pirate dudes translates here better than the eight inch figure, dig her shoe buckles! Supergirl is an absolute gem in this line. 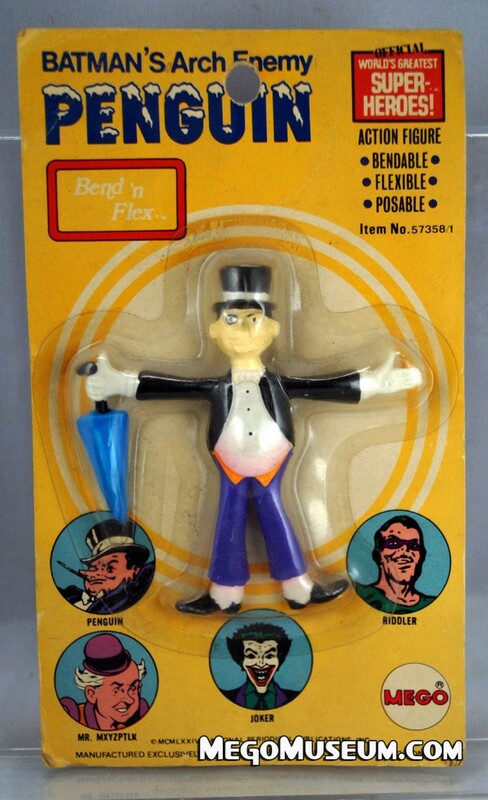 Bendy Myx and Penguin command more respect than their 8″ counterparts, must be the corrected scale. 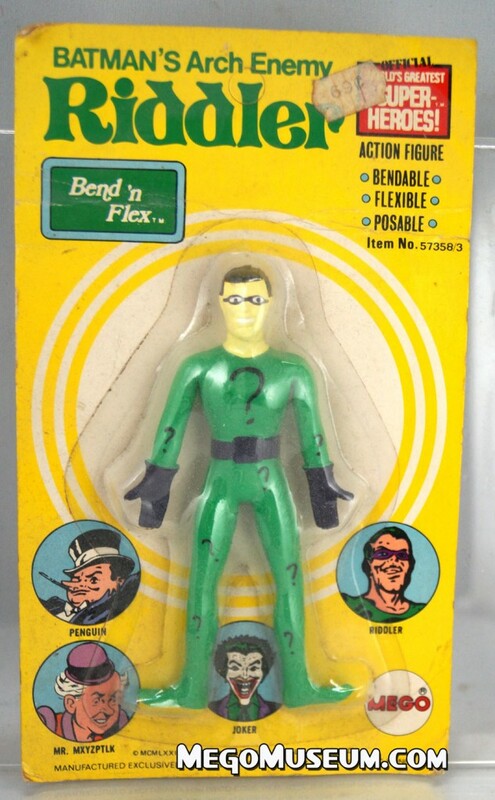 The Riddler is by and large, the hardest character in the series to find MOC. 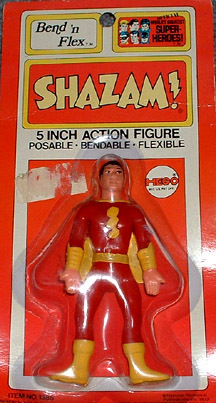 Mego added the cane for the Bend N Flex figure, so he looks exactly like his Carmine Infantino source art. 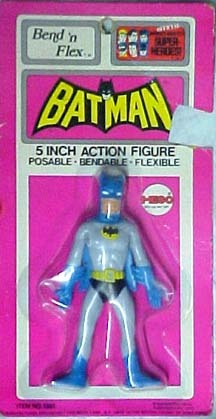 Australian Reissue of the Mego Batman Bendy showed up in stores in time for the release of the first Batman movie.